Is God a sadistic torturer? Coldhearted judge? Genocidal maniac? Unfortunately, our popular caricatures often make him out to be.God has some skeletons in the closet. At least, that's what many of us fear. "How can a loving God send people to hell?" "Isn't it arrogant to believe Jesus is the only way to God?" "What is up with holy war in the Old Testament?" These are difficult questions that our family, our friends, our culture--even we ourselves--are asking. 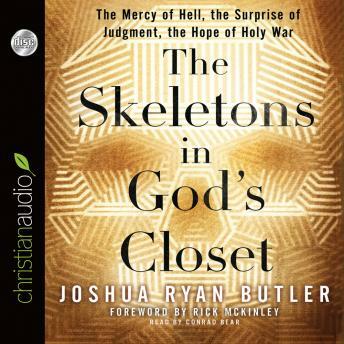 The Skeletons in God's Closet pulls these skeletons out of the closet to show that they were never really skeletons at all--but part of the good news that God is good and coming to redeem his world.Hell is not an "underground torture chamber" God creates to torture sinners, but a destructive power we unleash that God has promised to redeem his world from--it represents an extravagant act of mercy. Judgment is not "churchgoers go to heaven, everyone else goes to hell," but God coming to raise humanity from death and set his world right by calling things out as they really are--and the results are a shocking surprise. Holy war is not "the strong using God to justify their conquest of the weak," but God arising on behalf of the weak when the tyranny of the strong has raged for far too long--he is the hope of the world.Mercy. Surprise. Hope.Not what we usually think.Ultimately, The Skeletons in God's Closet uses our toughest questions to provoke paradigm shifts in how we understand our faith as a whole: we'll pull the "skeletons out of God's closet" to reveal they were never really skeletons at all. We'll grapple with the "skeletons in the ground" of tragedy, injustice and death in our world--to explore resurrection as God's good answer. Most importantly, we'll affirm that God is good "in his very bones"--not just in what he does but in who he is.This is a book that sings loudly, boldly and clearly: God is good and coming to redeem his world.